Dances of India – April 23: Purchase Your Tickets Today! 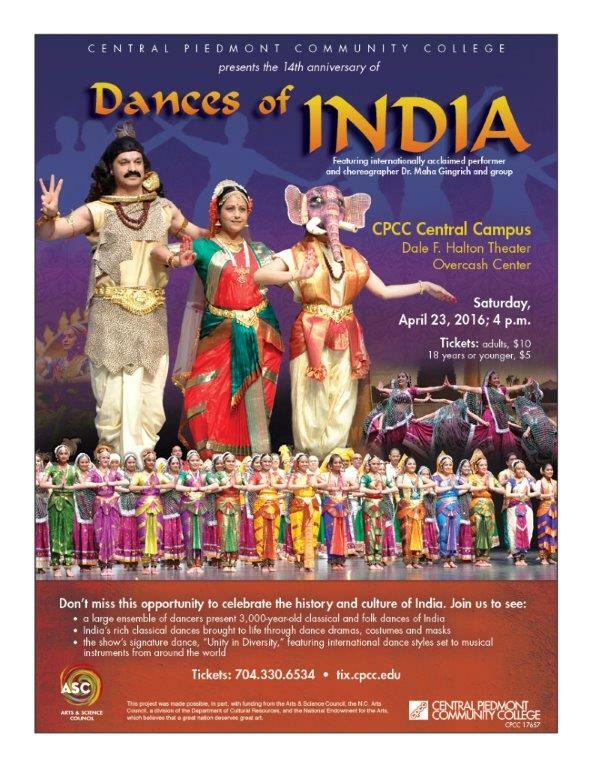 Dances of India is just two weeks away on Saturday, April 23, 2016, at 4 p.m. in CPCC’s Halton Theater. Come and celebrate the rich culture of India and the show’s signature dance “Unity in Diversity” set to live music, and seven international dance styles. We are featuring more than 60 dancers this year. Bring your friends to experience and enjoy the high energy folk traditions of India and the amazing costumes and jewelry. Purchase tickets here. Or purchase your tickets now by calling the box office at 704-330-6534. This entry was posted in Arts, Events and tagged April 23, culture, dance, Dances of India, halton theater, Unity in Diversity by Mallory Benz. Bookmark the permalink.